20 FPS gameplay and 15 FPS videos without mods. DRM: Simple disc check, no physical copy protection. Later versions of the Diablo Battle Chest starting in 2007 no longer include the original Diablo. Authorized third-party expansion. Cannot be played on Battle.net. Limited to exclusive fullscreen mode. Includes both the classic version with Battle.net access, and a modern OS compatible enhanced version. Enhanced version uses a DirectX wrapper for better graphical compatibility in modern operating systems. The enhanced version does not have Battle.net access, although the included classic version does. IPXWrapper provides a workaround for Windows Vista and beyond not supporting IPX, used in multiplayer. Put ipxwrapper.dll, mswsock.dll, and wsock32.dll in the folder where Diablo.exe resides. Battle.net's support section has the latest patches; spawn versions of the game require separate patches from the full versions. Battle.net will not connect without the latest patch. An unofficial single-player mod with a host of features including increased resolution and updated compatibility with modern Windows. 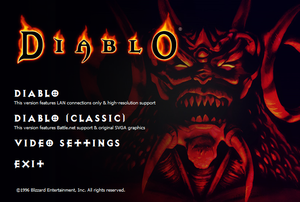 Copy the contents to the Diablo folder and open Belzebub.exe to play. Allows running at up to 60 FPS, in windowed mode, in resolutions scaled up to 1024p and various non-scaled, fixes crashing and DirectDraw compatibility issues, multi-monitor compatibility, and continuous attacking with the left mouse button held down. Can't play the vanilla game without the added content, multi-player isn't currently available, and the viewing area is simply increased; sprites remain small at higher resolutions. An unofficial mod that requires the expansion Hellfire to run which has various additions such as new spells, makes the game considerably more difficult, and has a tool for running the game on modern Windows. Another unofficial mod that also requires the Hellfire expansion. Patch game to the latest version first. Download the Diablo Windows 10 Patch. Copy DIABDAT.MPQ from the CD to the installation folder. Windows: Multiplayer chat hotkey macros are stored in <path-to-game>\diablo.ini. Selecting 320x240 in vidsize.exe (Windows) renders videos quarter size centered. Use Belzebub for pixel-based widescreen. The GOG.com enhanced version has stretch full-screen, pillarboxed full-screen, and pixel-based scaling as options. 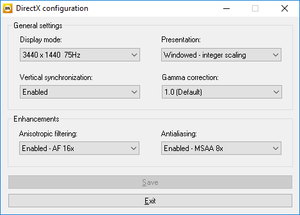 The GOG.com enhanced version has stretch full-screen with options that allow multimonitor resolutions. The GOG.com enhanced version has stretch full-screen with options that allow ultrawidescreen resolutions. The GOG.com enhanced version supports 4K resolutions. Use Belzebub or DxWnd or Diablo 1 Windows 7/Vista Patch. The GOG.com enhanced version supports windowed mode. The GOG.com enhanced version supports borderless full-screen. The GOG.com enhanced version supports up to 16x anisotropic filtering. The GOG.com enhanced version supports up to 8x MSAA. 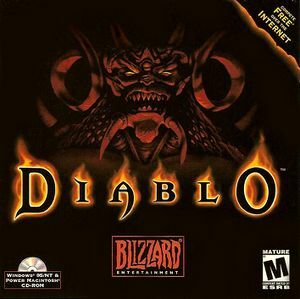 Use Diablo 1 Windows 7/Vista Patch. The GOG.com enhanced version supports vsync. 20 FPS gameplay and 15 FPS videos. Use Belzebub. Initial dungeon area monologues (every 5 levels) have no subtitles. Only up to 2 players are supported via modem. The official patches introduced a behavior where music no longer plays on the character or multiplayer selection screens. Later physical disks come pre-patched with later versions which have this issue. The game crashes when switching to another process on modern Windows, typically done using Alt+Tab ↹ or through the lock screen using Ctrl+Alt+Delete. The game can lock up with a black screen when returning to the main menu from the multiplayer menu on modern Windows. When entering a character name on modern Windows other text around the text entry area that should be cleared remains and appears partially cut off. When quitting the game the Diablo.exe process can remain indefinitely on modern Windows. Title screen effects such as the fire sometimes partially disappear on modern Windows. Colors can appear washed out, appear as a rainbow, or simply white due to a DirectDraw compatibility issue in Windows XP, Vista, and 7, including running in compatibility mode for these versions. Download the Diablo Windows 10 Patch and/or Diablo Hellfire Windows 10 Patch. Use DirectDrawFix.exe and select Diablo.exe. Apply a registry file from Blizzard for 1.09: x86 Windows, x64 Windows. The game can crash periodically with modern Windows, especially due to modern GPU drivers. Enable Windows XP (SP3) compatibility mode. After entering a character name in multiplayer you can get an error due to Windows compatibility issues. You must be running the latest version and not have the Hellfire expansion installed. 3 GOG.com enhanced version uses/requires D3D9. Information on running this game on Linux can be found on the GOG.com forums. A FOSS reimplementation of the Diablo engine currently in an alpha state; see the site for details. Normally on left mouse button down it only attacks once even if held down. Later games in the Diablo series provide this capability. The GOG.com release does not support Mac OS nor OS X. This page was last edited on 21 April 2019, at 12:04.